Allen Ezail Iverson was born in Virginia on June 7, 1975. He has had an illustrious career with the National Basketball Association or NBA, where he plays for the Memphis Grizzlies. Iverson came from humble beginnings. He grew up poor and was raised by his mother, as his father had deserted the family. He always had an interest in sports, and played football and basketball throughout his school career before he enrolled in college. In 1993, Iverson’s life would be filled with controversy. He and his friends become involved in a scuffle with teenagers of Caucasian descent at a bowling alley in Hampton, Virginia, when Iverson was 17 years old. The events surrounding this incident are not known. It is certain that Iverson’s group, which mainly consisted of African-American youth, engaged in a loud argument with the other of teenagers, after which the fight became physical. The police arrested Iverson and his friends while the other group was left alone. Iverson was convicted to serve a prison sentence of 5 years as it was alleged that he struck a lady in the head with a chair. Evidence was produced in the form of a video taken at the scene of the scuffle. It was called into question, however, whether the video had indeed shown that Iverson had committed the act. Several prominent African American figures such as Bill Cosby and Spike Lee argued against the unfairness of his sentence. Iverson spent only four months in prison. He was recruited by a basketball coach from Georgetown University, John Thompson. Iverson’s performance in basketball at the University was remarkable. In 1995, he earned his team a gold medal at the World University Games in Japan. Under Thompson’s guidance, he left school early in order to take up an opportunity with the NBA. In 1996, he was drafted by the Philadelphia 76ers, which was the beginning of a successful career. Averaging 26.8 points per game, he was considered the leading scorer of the NBA by 1999. In 2001, the NBA declared him its Most Valuable Player, and in 2006, was traded to the Denver Nuggets. 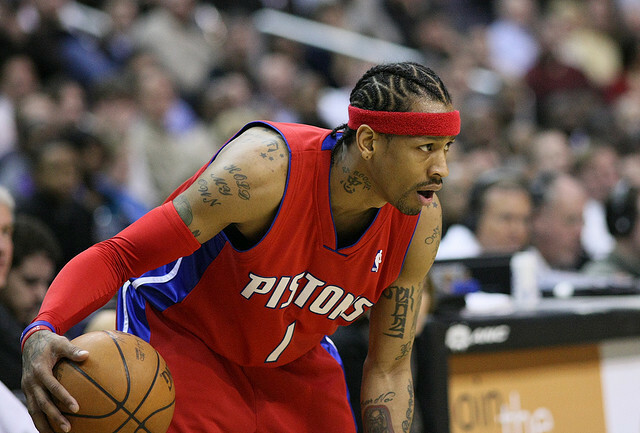 During 2008, he played for the Detroit Pistons, but after a lackluster performance, in August 2009 he was signed with the Memphis Grizzlies. The famous basketball player often ran into trouble with authority and with the law. In 1997, he was arrested for carrying a concealed weapon and for marijuana possession. In 2005, his bodyguard was arrested for assaulting a fellow patron of a club who refused to leave VIP so that Iverson and his party could enter. In the same year, David Stern, the commissioner of the NBA, banned ‘hip-hop’ related attire such as baggy jeans. Iverson protested against this new code, stating that the individual should not be judged based on what he wore. It is for these reasons that the sports star has been considered one of basketball’s most outspoken and controversial figures.